Playing our 2018 Gen Con tournament module, The Black Heart of Thakulon the Undying? We know many of you did and even sent in your scores so you could compare them to our Gen Con champions! We’ve gotten feedback that the tournament player packs are hard to find on our web site, so we took some steps to make that a little easier on you. We have redesigned our Tournaments Page! …well, the Thakulon section at least. In our continuing effort to make the website and our resources as friendly to the fans as possible, we have modified the Tournament Page to break down the various aspects of the tournament and its results so you can locate them more readily. Oh, and if you haven’t looked, we ALSO added that information to the product page for The Black Heart of Thakulon the Undying. So you’ve got a couple of places to find that information now! Get everything you need to run the tournament at home! And don’t forget to share your own tournament results with us! 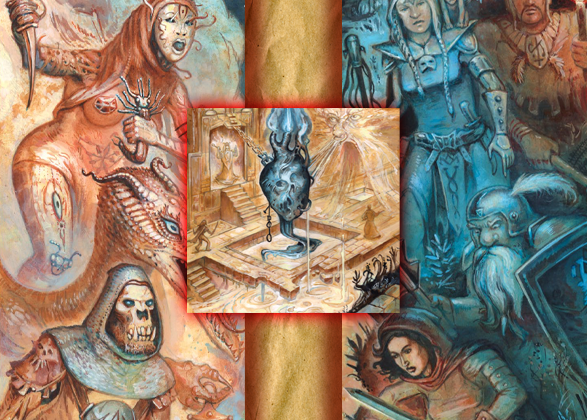 The Black Heart of Thakulon the Undying is a fun, exciting tournament-style adventure that you can run at home for all of your DCC RPG players. The Player Pack makes it easy for you to set up and run the event, and gives you a chance to see how you would have fared at Gen Con! And now we’ve lined up everything you need in a much easier to find way.